The third book in the crazy good and wonderfully gruesome Monstrumologist series takes plucky young protagonist Will Henry to a far darker place than ever before, and this time it’s not the monsters outside he fears so much as the monster within. After receiving a mysterious package that contains a grisly nest made of shredded human tissue and bone, Will and Dr. Warthrop are launched on a grim new quest to find and capture Typhoeus magnificum, The Father of All Monsters. This mysterious beast has never been seen, and its only calling cards are the flesh nests it makes of its victims and it’s corrosive spit that if touched, turns men into cannibalistic zombies. Every monstrumologist who has tried to track it down it down has never been seen or heard from again. Naturally, Warthrop has second thoughts about taking Will Henry on such a dangerous mission, and ends up leaving him with his mentor Dr. von Helrung in New York. But when von Helrung receives word that Warthrop is dead, Will Henry decides to take matters into his own young hands and find out the truth—even if it means losing his life. Sailing from America to darkest Africa and meeting such literary luminaries as Sir Arthur Conan Doyle (you didn’t know he was such a fan of monstrumology, did you?) and Arthur Rimbaud (with an encore appearance of fan favorite, the dastardly Jack Kearns) along the way, Will’s gripping globetrotting journey is nothing compared to the long bleak road he is walking within. As Warthrop slowly begins to give his humanity more airtime than his burning ambition in this most excellent third volume, Will disturbingly begins to slide the other way. “I thought I knew the cost of service to the one whose path lies in the darkness. I did not.” Always pure of heart in the past, now Will finds himself committing not one but two desperate and irrevocable acts that will have consequences he can’t quite understand, but that the world weary Warthrop knows all too well. Will has always served as Warthrop’s moral compass (“You are the one thing that keeps me human”) but now it may be the egotistical but ultimately good doctor’s turn to help Will expunge the darkness that has begun to take deep root in his soul. Oh, how I love these books! Oh, how I wish there was a real Society for the Advancement of the Science of Monstrumology, and that I could sit down and have Darjeeling tea with Will and Dr. Warthrop! Like The Historian or The Magicians , this is a first rate philosophical horror/fantasy novel for both teens and adults that makes the heart pound, the blood sing and the mind bend with each new alarming adventure. That’s why I took this news hard. The real fear has nothing to do with Typhoeus magnificum, but that this wonderfully wrought gothic horor series may be coming to a premature end. (But then I heard this, so WHEW! and YAY!) Lucky you still have this magnificent tome to look forward to. What would you do if you had a fear that was bigger than you were? Run away? Hide? Or would you call for help? Thirteen-year-old Conor is keeping a terrible secret about his mother’s illness, one that is so awful he doesn’t dare speak it aloud. So when a giant monster shows up outside his window one night and threatens him, he isn’t even scared. Because no monster is equal to the rage and sorrow he has locked away inside. But when the monster tells Conor that the reason it’s there is because Conor called it, he doesn’t understand. How could he have brought the monster without knowing? And is the monster there to help or to hurt him? As the monster continues to make its nightly visits and Conor’s mother gets sicker, Conor becomes desperate to put an end to the mystery of the monster’s presence. When the truth is finally revealed, it is both wonderful and terrible. This intriguing modern day fable about the lies we tell ourselves in order to survive tragedy was actually thought up by British author and activist Siobhan Dowd, who died before she could complete it. 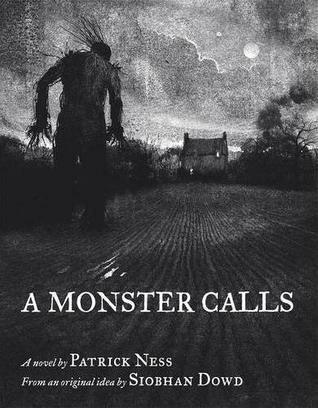 It was then passed into the hands of her colleague Patrick Ness, who in his own words, “took it and ran with it.” The result is a lyrical, melancholy tale, lushly illustrated with haunting images by debut illustrator Jim Kay, that provides no easy answer to the question of human suffering, but is full of hope nevertheless. Poor Anna. It’s senior year and instead of getting to hang out with her best friend Bridgette and nurse her crush on Toph, the indie band boy with killer sideburns, she is instead being forced to go to school abroad. In Paris. I KNOW. I didn’t feel sorry for her either. Until I discovered the sum total of what Anna knows about France: “The Eiffel Tower and the Arc de Triomph, although I have no idea what the function of either actually is. Napoleon, Marie Antoinette and a lot of kings named Louis…The art museum is called the Louvre and it’s shaped like a pyramid and the Mona Lisa lives there…the food is supposed to be good, and people drink a lot of wine and smoke a lot of cigarettes.” That’s not very much to go on. Also, Anna speaks French not at all, and is a little (okay, a LOT) germaphobic. How in the world is she supposed to enjoy the City of Light when she doesn’t know the language and is too skeeved to take the Metro? Lucky for Anna, help comes in the form of a group of quirky housemates who quickly adopt her, including the devastatingly handsome and super nice Etienne St. Clair, who is part American, part British, part French and all awesome. It would be easy for Anna to get lost in his big brown eyes, except for one little thing—St. Clair has a girlfriend, and they’ve been dating for ages. Plus, every other girl in school finds him just as righteous as Anna does, so there’s no way she stands a chance…or does she? Because in short order, St. Clair seems to find Anna just as intriguing as she finds him. But what about his girl friend? And what about Anna’s still-very-much-alive crush on Toph? In the most romantic city in the world, Anna will have to navigate some seriously rough relationship waters before finally figuring out who she wants to be with—and who wants to be with her. This sparkling overseas romance by Stephanie Perkins is a sheer delight from start to finish, brimming over with witty banter, poignant subplots and spot on characterization. Anna’s love of old movies and St. Clair’s admiration of Pablo Neruda are just a few of the great little details that make them o-so-real. A perfect way to ease the heat of the dog days of summer reading.